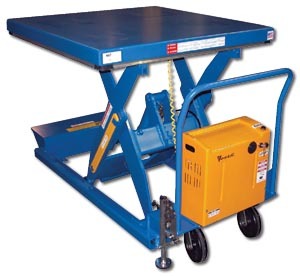 Heavy duty powered lift tables to transport and elevate the heaviest of loads. Engineered for smooth, safe and efficient lifting and lowering. Heavy duty 12V DC power unit with deep cycle battery and an on-board battery charger is standard -- a battery charge indicator is optional. Rolls on 8" glass filled nylon casters, 2 swivel, 2 rigid. Complete with floor lock and patented electric pinch point guards. Push buttons to raise and lower lift are located on the power unit and in the pendant style push button control. Key-operated ON/OFF control for better security is built into the power unit. Minimum frame width is 34". Add 25" to platform length for the overall length. FOB Shipping Point. Reduce work fatigue and injury with the Portable Traction Drive Option. Allows a single operator to safely and ergonomically transport products. This factory installed option is available on portable equipment including the Portable Scissor Table, Pallet Master/Pallet Servers, Tilt Master and High Rise Lift Truck. An alternative to costly fork trucks, the PTDS includes a combination throttle/direction butterfly style controller, an adjustable yoke and auto reverse emergency "belly" switch. Power pack is 42"W. FOB Shipping Point. Time (sec.) Wt. (lbs.) Price Ea.